There are currently 93,463 users on this website. 1964 No Mintmark (LMC) Mistake? Hi guys .. What would be the name for that "Error" in the top of the coin? i dont know much about it.. There's no error, just damage. It's Post Strike Damage ( PSD). This is impossible to happen at the U.S. Mint. 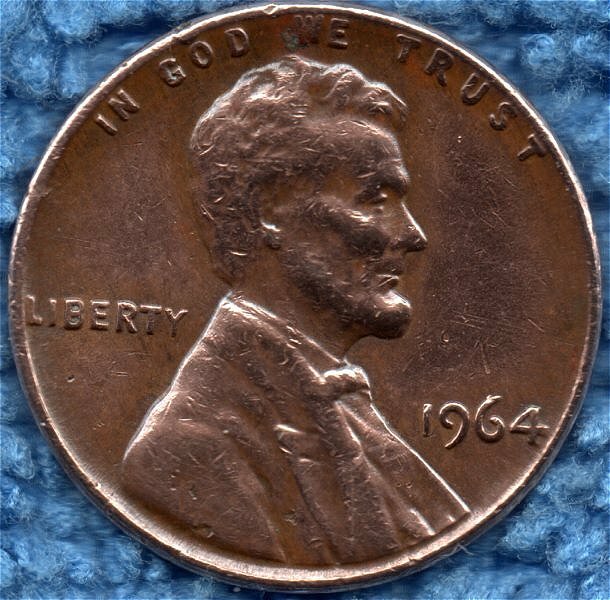 Your photo shows a 1964 coin produced at the Philadelphia mint, meaning it would have no mint mark. What "error" are you seeing on this coin? Looks normal. No mintmark means it was made at the Philadelphia mint. The dings on the rim at the top are post minting damage ( PMD) not an error. Hi, Maybe I'm the only one seeing it.. Next to the "W" in "we" theres an "s" or maybe. its just me? Next to the "W" in "we" theres an "s" or maybe. That's just a blob of copper corrosion. Nothing out of the ordinary about this coin.